Today should be an easy one. Half our stuff is already in the car and once we get the rest in, it is a twenty minute drive to Le Moule. We are meeting Shani at Le Spot, a restaurant that overlooks the prime surfing place in Guadeloupe. . . .She came right on time and guided us back to their compound which consists of a building with two duplex apartments, one of which is ours for the week, a small swimming pool, her family's house and her grandmother's house, which is mostly an covered dining terrace for twenty or more people which they fill some Sundays with her family. In my imagination I see her son asking what kind of house he should build her and she responds that all she needs is a place where she can have her whole family together. Dawn wanted a hike today so I picked one from the internet that would take us from just east of town to the “Gates of Hell” of le Moule. It would be a 10 kilometre round trip affair, mostly along the shoreline. 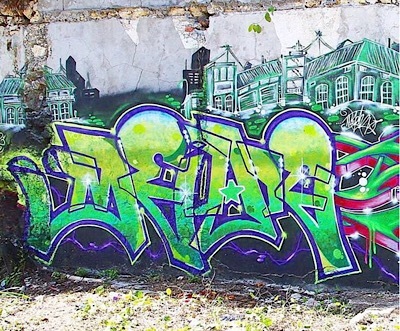 We didn't take any pictures so I grabbed this grafitti photo from the internet to represent what looks like the bombed out building covered with graffiti behind our starting point which was a beach having its facilities rebuilt so it was mostly a construction site. Within five minutes we are on a wild and rugged shore on a beautiful trail that first swings out onto the rocks near the water and then back under the trees. Soon it arrives at some fields which we cross, before it climbs two hundred feet or so through the forest to a view above the ocean. Then it leads us down to an overlook of the cove. 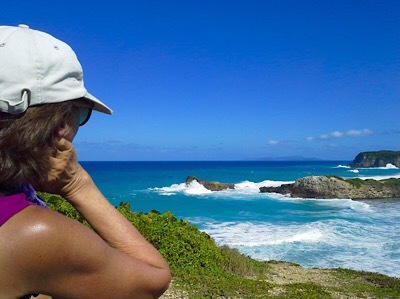 We sat for awhile admiring the ferocity of the waves formed by a week of wind coming from the east or northeast. I did take pictures here but they were inadequate except the one you see. The trail had a last joke to play on us when it took us past a recently dead goat. On our return to the car, we soaked our feet in the small surf. before heading back to our place. The next day we drove forty minutes to plage de St. Felix to swim on a south facing beach, avoiding the the large waves around east facing le Moule. After our swim, we had lunch at the Baie de Pelicain. We had been here a year ago for a sunset drink. It is a nice spot on a small bluff overlooking a little harbor with its aforementioned pelicans. Last year there were four and this year, four again. we don't know if they are the same birds but I think so because a fifth appeared and somehow got the signal that it wasn't welcome, and so it flew off out to sea even though the fishing is really good here. Best practially under our feet.because they dove successfully time after time a few feet from where our bluff met the water. 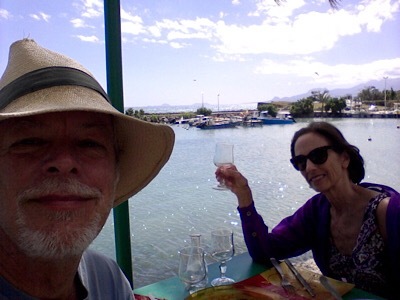 I must admit that I can give in to the tropical fantasy of coming out of the water for a nice lunch with a good chilled rosé, but the selfie shows that my Panama fedora has morphed into peasant head gear and I am not the suave elgant man of my dreams. 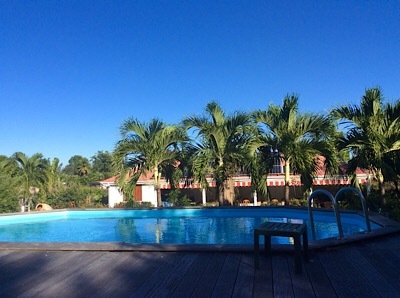 The sun is on the pool in the morning and Dawn is taking advantage to take a dip and I am taking advantage to get a photo of the beautiful woman that I have loved for more than half my life. Sometime you just have to shout these things out in sheer joy. We took a hike today where we needed to have one or two of the machetes that Michel showed us this morning. The trail called the Ravine de Audoine was on the outskirts of town but civilization was invisible from it. 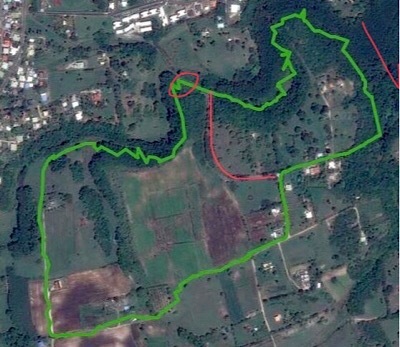 On the map, we started at the red circle and moved clockwise on the green trail and then took the red shortcut back to the car. You can see how close we were to the houses but we felt we were in the middle of the Amazon. We have not talked about the hurricane that came by last fall, but it has damaged some of the boats and the flora of the island. 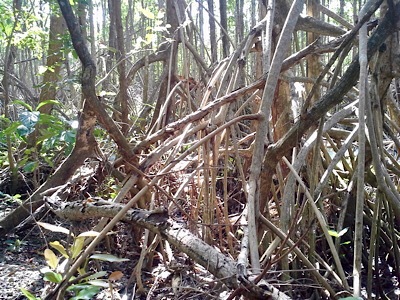 Many places have been repaired but this trail through a mangrove swamp has escaped attention. It was a little like we were dragging the African Queen as we worked our way around newly fallen trees and over downed branches. For myself, it has been awhile that I have hiked a trail where I wasn't sure that we could keep following it. It would peter out only to reappear some yards away. This can be disconcerting especially when it stops at the water's edge. This trail is mostly used by locals who bring in their crab traps to capture the animals that will be eaten at traditional meals. 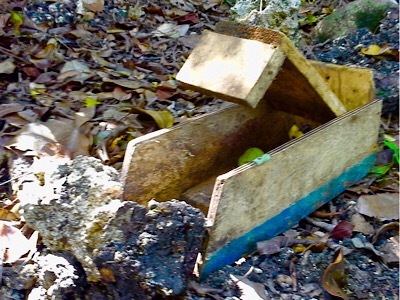 The traps are made from recycled construction site material. The photo shows the basic design with the blue stripe showing who owns it. After the crab is caught it needs to be kept and fed for awhile before you can eat it, both to improve to taste and more importantly to remove any poison in the crab from its eating the fruit of the manchineel tree. Eating the crab could be fatal if it has recently eaten the apples of this tree. n We invited our hosts over for a drink Friday. In the morning, we agreed on them coming over “ce soir,” but we didn’t mention a specific time in the evening. I figured we should be ready any time after 5:00 since the sun sets around 6:00. Michel was working on the grounds around 5:30, and we exchanged “Bonsoirs.” We figured he had some work he wanted to finish up so maybe they would come by around 6:15 or 6:30. By 7:00 or so, I figured that either they forgot or we misunderstood and they were going to drop by the next evening. So we made a salad and were just about to sit down and eat it when they showed up! We were happy to see them and quickly switched gears to Ti Punch and wine and appetizers. It was a good conversation for a couple of hours. As often happens, the subject went to politics, and they couldn’t understand how Trump won when all Americans that they meet here did not vote for or support him. Sunday morning, we met Michel for what he said was going to be a garden tour. It turned out to be a three-hour lesson in the geological, biological and human history of Gwada and its flora, fauna, music and customs. It was totally fascinating, partly in French and partly in English as he used to be an English teacher. 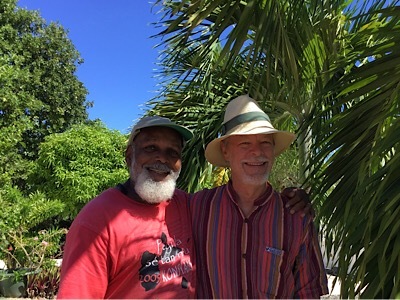 He loves his country and believes it is important for descendants of slaves as well as descendants of European colonists to know the history of this country that they either inhabit or visit. He showed us a tambour made from a barrel (slaves had been forbidden to cut trees for drums since the European settlers wanted all the wood they could get for building their houses and furniture.) He also showed us a smaller drum with heads at both ends and said that there are seven rhythms native to Gwada, (Gwo ka) and only one of them, the mendé, came from elsewhere, the Congo, and would be recognized in other African countries. 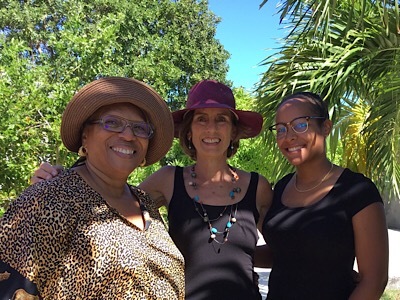 Near the end of our history lesson, Michel’s wife, Yvelle, brought out fruit punch and two bottles of rum (that I did not imbibe at 11:30 a.m.) and some boudin, à spicy, salty blood sausage. 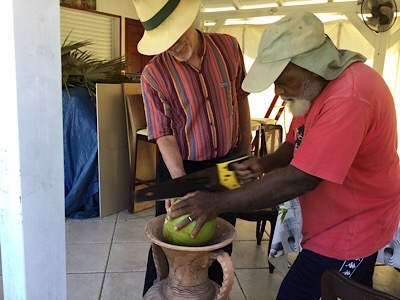 We got some photos to remember them by, including ones of Stephen helping Michel saw apart, then clean out a calabash. 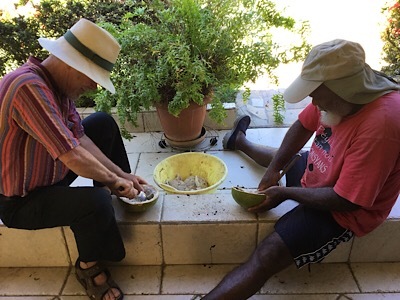 The calabash needs to dry out for a couple of days in the sun, then we will sand them smooth inside and then they can be used for many purposes. They are often finely incised with designs and sometimes made into lovely lamps. When we get home, we will decide what to do with the two Michel gave us. It was raining when we said good-bye to Michel and left Le Moule. He said, “the weather is sad because you are leaving.” Interesting that the phrase for “It is raining” (Il pleut) and “He is crying” (Il pleure) are quite similar. When I was studying French in high school, I used to get them mixed up. His other parting words were “Please vote Trump out of office. We are scared.” I said “We are scared too.” Stephen thinks we should go to Pennsylvania for a few weeks before the next presidential election to work for the Democratic candidate. It is a swing state, and maybe we could stay with his brother there and try to swing some votes. He was raised there. 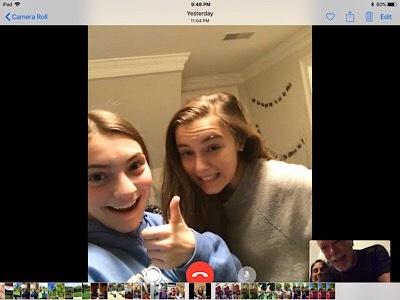 Saturday night, the girls face-timed us and we had a great time. They were trying to edit Dawn's Wikipedia page and we were trying to figure out how they might pop over from a family vacation in Miami to visit us in Deshaies. We don't really have beds for them but who knows. They seem to be in good spirits and it was fun to hang out with them digitally. It might be a pitter patter, but today the rain seems a little pushier. Here is a photo from the click clack (convertible sofa) that I took in between the rain episodes. 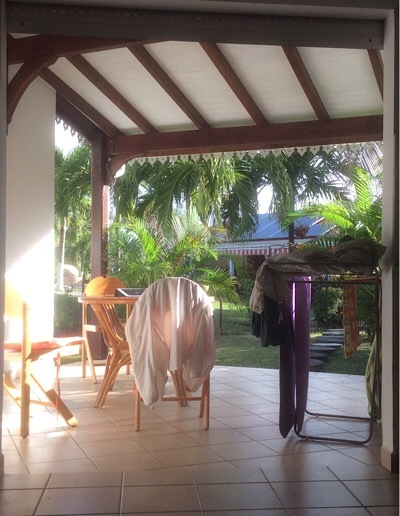 It shows what is our porch, dinner room and yoga studio in morning light. The car is not far away but I brought our rain coats inside from the car in case we want to leave while it's raining. Today we have an hour drive, so maybe we will write our review as we go. We will place it here. I listened to the Superbowl last night and even though the Patriots are my team, I was okay with the loss. The team demonstrated its strengths and at the same time had its weaknesses exposed. Also, rooting for a team that is too successful is boring. Remember the Yankees.